Feathers have an exquisite beauty, tenderness, and functionality that has captured the attention and imagination of people for many centuries. Almost every culture and religion has found a niche for the feather that often penetrates to the core foundation. These delicate works of nature have been utilized as personal adornments, ritual objects, decorative artifacts, and tools by almost every society since the beginning of civilization. Feathers are specialized epidermal growths, formed by papillae, that are composed of a fibrous protein named keratin (about 90%), lipids, and pigments that give them their beautiful colors. Keratin is an ideal material for feathers because it is lightweight and flexible, yet strong enough to form a structure that can withstand the rigors of flight. Feathers are also the ideal framework for composing wings---they are lightweight, yet capable of providing a relatively solid surface to achieve the lift necessary to launch a bird into the air. When considering materials that would be suitable to fabricate wings, it becomes obvious that feathers are far superior to other materials because of their flexibility, durability, and size to weight ratio. Feathers can be divided into several categories. Contour feathers are found on the wings and backs of birds, while down feathers are usually placed underneath the contour feathers to provide insulation for the bird. A primary feature present in all feathers is the large stem (termed the "rachis" or "quill") centrally located that provides a "backbone" around which the feather is constructed. 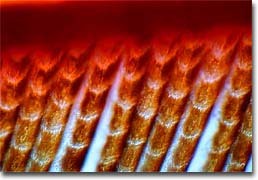 Extending from both sides of the quill is a linear cluster of barbs containing a majority of the feather's pigment. Together, the barbs and the quill constitute the body or vane of the feather. 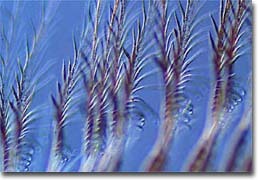 Branching at a 40-degree angle on each barb is a network of barbules with interlocking hooklets that provide both stiffness and flexibility to the feather. These hooklets allow a split vane to be resealed making it whole again. Contour or primary feathers have between 6 to 10 hooklets per barbule allowing the barbs to hold firmly together, thus forming a fairly solid surface that is very light in weight. The surface of a feather often appears to be water repellant, and this is due to preen (or "uropygial") glands that secrete oils which birds apply to their feathers to help make them waterproof. These oils serve the dual purpose of keeping the feathers from becoming dehydrated and helping them to maintain their integrity. Birds lacking the preen gland are forced to dry their wings after being in the water. The phenomenon of color in feathers is attributed to both the basic reflection of incident sunlight and also to interference of reflected wavelengths that become recombined to produce an almost iridescent color spectrum. 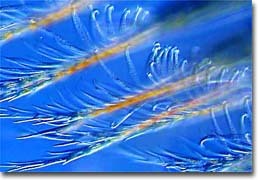 Under normal circumstances a pigment protein named melanin and/or conjugated aromatic compounds known as carotenoids are incorporated into the feather's keratin to allow certain wavelengths of light to be absorbed by the pigment. 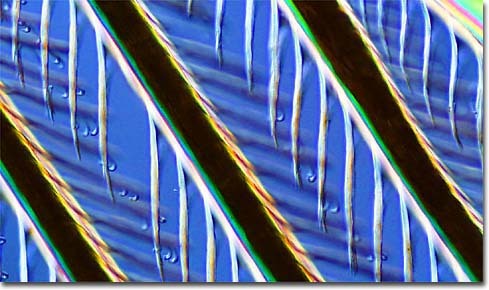 The colors that are not absorbed are reflected back towards the observer, making the feather appear colored. 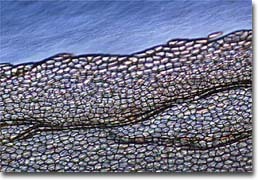 In some circumstances, however, the surface layers of keratin are filled with an assortment of air sacks that increase the number of reflective surfaces of the feather. In this case, many of the colors appear iridescent due to interference of reflected and refracted light. Samples, photomicrography, text, and the impetus for building the Feather Collection were provided by Nathan Cross.